The C.A.S.T. for Kids Foundation was formed in 1991 to provide disabled and disadvantaged children the opportunity to enjoy a quality outdoor recreational experience through fishing. 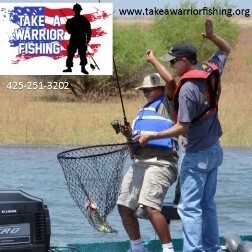 In 2011 the Foundation started our Take A Warrior Fishing program, whereby American Military personnel are taken out on the water for a fun day of fishing and boating; an activity that most would not experience otherwise. This program is a great way to thank these men and women for their service to our great Country. Each event provides all the Warriors with a Lews American Hero rod and reel, a tackle box, top-notch bass fishing tackle, t-shirts & hats. All for them to keep! After a morning of fishing, the Warriors are treated to a lakeside BBQ, followed by awards celebration to honor each Warrior. Take A Warrior Fishing events are a community-based outdoor recreation experience through the sport of fishing. Numerous studies have shown that traumatic events not only affect the psychological structures of the self, but also the attachment and meaning that link individuals and community. This program seeks to restore those disconnects. Each event will have the capacity to accommodate up to 150 families and brings in numerous community partners. Since the program was started in 2011, numerous Warriors have developed friendships with the the volunteer boaters at events that have led to additional fishing trips.